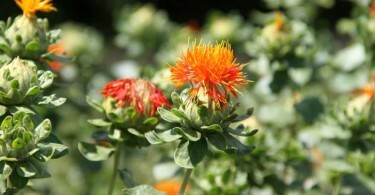 Safflower [Carthamus tinctorius] is commercially cultivated for vegetable oil extracted from the seeds. Safflower seed oil is flavorless and colorless, and nutritionally similar to sunflower oil. Carthamus tinctorius is used in some testosterone boosters, probably because of its possible 5-aplha reductase inhibition properties. In a study evaluating 14 Thai plants, Carthamus tinctorius was the most potent 5α-reductase inhibitor and hair growth promoter.